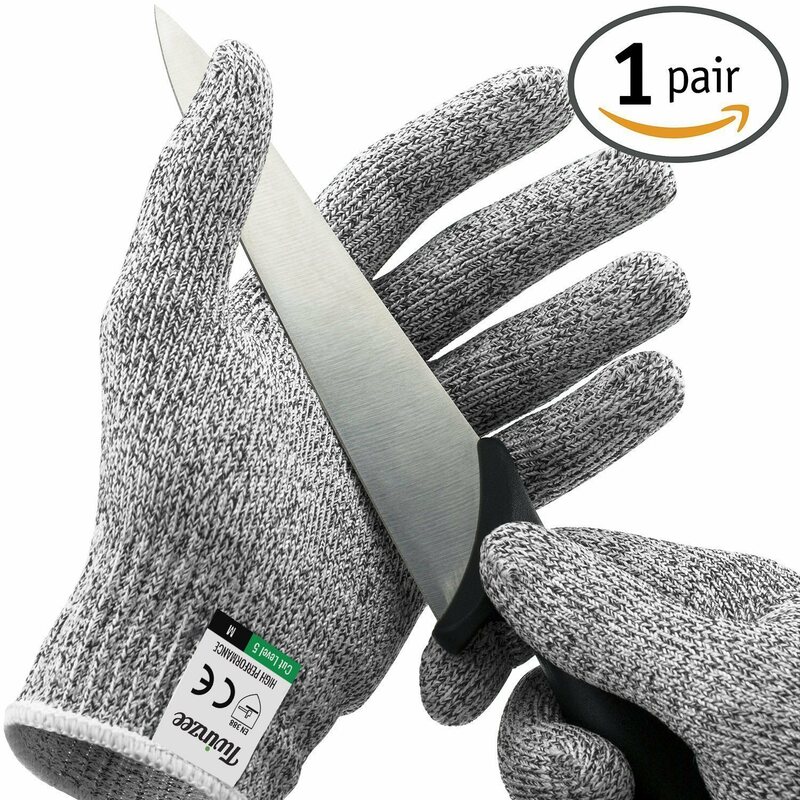 Twinzee cut resistant gloves let you handle your grater, knives, and mandolin without worrying if you’ll need to bandage a finger or worse… make a trip to the hospital. Made of food safe ultra high molecular weight polyethylen these gloves have been designed to resist cuts from even the sharpest blades. You can feel secure in knowing they have an EN388 Level 5 cut protection rating. Your Twinzee gloves will reduce the likelihood of sustaining serious injury if accidents happen. What’s more of a hassle than working slowly because you’re afraid you’ll cut yourself? It’s trying to maneuver a blade with an ill fitting glove on your hand. That’s why Twinzee cut resistant gloves come in 5 sizes – to ensure a snug fit. The elastic material in your Twinzee gloves makes keeping a firm grip on slippery and awkward items a snap. You’ll be able to complete tasks more quickly and accurately while avoiding nicks and cuts. Twinzee gloves are ultra-thin, soft against the skin, and highly elastic. Weighing less than an ounce, they have none of the bulk found in other gloves on the market offering the same protection. Because every order includes 2 ambidextrous gloves, save one for meal prep and use the second for your other blade friendly jobs. Even better – get more than one pair! Click the orange “Add to Cart” button and Order your Twinzee Gloves Today ! 100% satisfied customers, and you? “I have previously cut myself when preparing food as i loss my concentration and whoops the knife makes my skin smile. Since chopping onions with these snug gloves on i have less cuts and i feel more confident in the kitchen. I have not tried or taken a knife to test the fabric knowingly yet. But other people have tried it and report the gloves hold up to the challenge. These also kept my hands warm too. I cant wait to get these down the allotment and use when chopping wood and pruning etc.